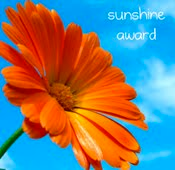 Pamela, over at Ginger Girl, has bestowed upon my blog the Sunshine Award. Thank you so much Pamela! For those of you have not found her blog she has great outfit posts, fashion finds and lots of other fun randoms. Definitely check it out! 1. Put the logo on your blog within a post. 2. Pass the award on to 12 bloggers. 3. Link to the nominees within your post. 4. Let them know they received this award by commenting on their blog. 5. Share the love and link to the person from whom you received this award. :) I can easily see why you got this award! Intense Guy-You are so welcome also. Aww thanks! Dorkys-You are very welcome! You should go buy you some flowers! Peppermint Sage Designs-You are welcome. It is a happy little thing isn't it!